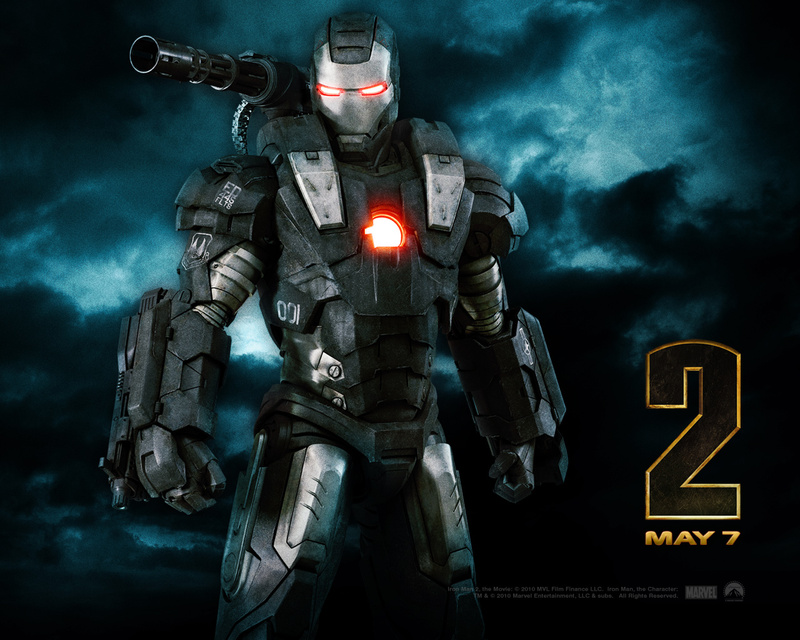 Firstly, we all know what Iron Man looks like so I've posted a photo of War Machine, played by Don Cheadle. Awesome. Anyway... Robert Downey Jr. is back as the narcissistic, eccentric, Tony Stark. Picking up about 6 months after the first movie, the sequel is about how Tony Stark and the rest of the world deals with this new found superhero. Life is peachy for Stark, he has stopped selling weapons to the government and he has "...successfully privatised world peace", as he puts it. Also loving the spotlight and fame that has come with his superhero status. Unfortunately, this isn't good enough for the U.S government. They are constantly putting pressure on Stark to turn over the suit so they can use the technology. This push is spearheaded by Stark's old rival, Justin Hammer (Sam Rockwell) from Hammer Industries. A weapons giant that is looking to use the technology from the Iron Man suit to create weapons for the government. At the same time, a new villain rises straight out of Russia. His name is Ivan Vanko a.k.a "Whiplash", played by Oscar nominee Mickey Rourke (The Wrestler). He has a family history with Stark and is out seeking revenge. With a knowledge of the arc reactor technology used in the Iron Man suit, Whiplash creates his own piece of destructive weaponry. While the quality of an actors British accent doesn't really bother me, I hate a bad Russian accent when a character tries to speak English. Rourke does an excellent job portraying this tattooed Russian beast. He doesn't do too much talking but he plays one of the more intense comic book movie villains I've seen in a while. Nobody will reach the stratosphere of Heath Ledger's Joker but this was quite a terrifying villain. Playing a bigger role in this sequel, Colonel James "Rhodey" Rhodes (Cheadle) gets his own suit and becomes "War Machine". Much to the despair of Iron Man fans, Terence Howard was replaced by Don Cheadle for the sequel. While he put forward a solid effort, he couldn't quite wear that army uniform like Howard could. Another new addition to the franchise, Scarlett Johansson plays the Black Widow. She played a small role and we didn't see her in action much but I'm thinking she'll be around for the next one and possibly the Avengers movie due out in a few years. After getting a sneak peek after the credits of the first movie, Samuel L. Jackson is back as Nick Fury, director of SHIELD. The big, mean, eye patch wearing recruiter of Avengers is an intimidating presence and just leaves you wanting to see more of him. This franchise is very different to all your other superhero movies because everyone in the movie knows who Iron Man is. Because of this the character of Tony Stark is much more involved in the movie compared to others such as Batman or Superman. That makes this movie so fun to watch because Stark is so loveable because of his "coolness" factor that no other superhero has. Downey, once again portrays an excellent Stark and together with the help of the rest of the cast there is some great comic relief in this movie. It doesn't go over the top but it's around enough to keep this a light hearted affair. While I would have liked the final showdown to go a little longer, I still thoroughly enjoyed this movie. It combines a good mix of both action and acting so it will appeal even to viewers that aren't big on superhero movies. Go check it out, it's a lot of fun. Also, stick around after the movie, there is a little surprise appearance after all the credits... something to do with the Avengers.